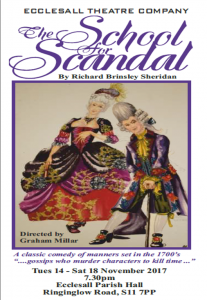 This evening we travelled back to the 18th century to attend the full dress rehearsal of The School for Scandal, the first ever performance we have seen by Ecclesall Theatre Company. The comedy of manners, written and published by Irish playwright Richard Brinsley Sheridan in 1777, offers a satirical portrayal of 18th century British society through the interweaving stories of three houses who spend their time in constant turmoil striving for superior position and advantage amongst themselves by destroying the good names of their peers. Thanks in part to the great direction by Graham Millar, the cast of 17 beautifully captured the voices and body languages of 18th century upper classes and aspiring upper classes, including wonderfully mastered speaking directly to the audience with superb comedic affect. My stand out performances on the night came from Gary Jarvis and Laura Miller as Sir Peter Teazle and Lady Teazle who perfectly portrayed their sugar daddy, spoilt brat newly wed relationship with chemistry. passion and arguments; Gerald Brown as Snake, who brilliantly combined two-faced manipulation, charm and seduction; David Cheetham as Sir Oliver Surface who pulled off his laddish character’s Twelfth Night style plot and whose early scenes with Richard Bailey Jones as Charles Surface, reminded me of Blackadder The Third and his relationship with Prince Regent. Other stand out performances include Kath Connelly as Mrs Candour who strongly reminded me of actress Celia Imrie in both her voice and mannerisms; Bill Darwin as Honest Moses, who not only had one of the best ever names for a character but played the part perfectly with just a hint of Oliver’s Fagin and television presenter Gyles Brandreth; and Philip Smith as the aspirational footman Trip, who also made an excellent framed portrait with attitude, alongside Meg Crook as the Servant. I must also praise David Crook and his team for the stylishly simple, mainly black and white set that perfectly captured both the era and the changing households, and the wardrobe, make up and hair team for their elegant costumes, wigs and of course beauty spots. I must admit that I am not usually a fan of costume dramas but this performance did an excellent job of at least converting me to costume comedy, though it did leave me wary of games of hide and seek and venomous long stories, Chinese whispers and rumours. Proof that gossip is not a recent invention, The School for Scandal will be enjoyed by fans of comedy, costume dramas and a good gossip and proves that good comedy and relationship drama does not date even when it’s 240 years old and that great performances can take place in small venues. Audiences are guaranteed to leave the show delighted that the characters get the comeuppances, good, bad or romantic, that they deserve, whilst also be guaranteed to recognise the characteristics of someone they know within the characters or the people they gossip about. Performed at Ecclesall Parish Hall from Tuesday 14 to Saturday 18 November at 7.30pm, tickets are £7 for adults and £5 for OAPs (Tuesday performance only) and children, with a buy six tickets get one free offer available for all nights apart from Tuesdays. 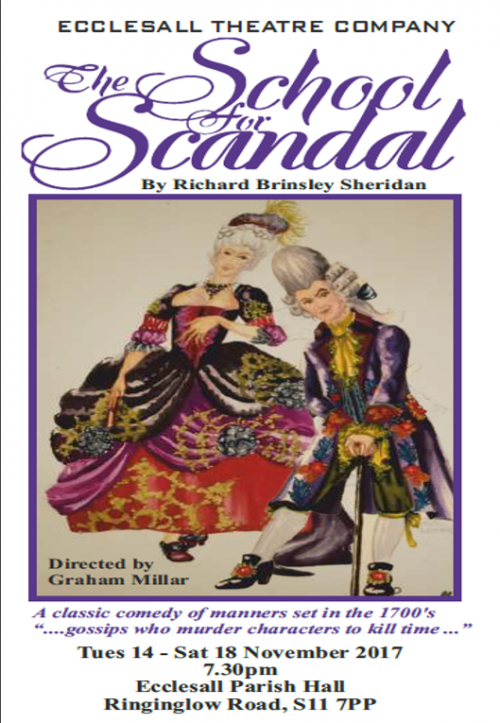 To book visit http://sivtickets.com/event/schoolforscandal or telephone 0114 266 7525 or 07763 153842. Founded in 1938 Ecclesall Theatre Company are an established and flourishing amateur theatre company. They are a friendly and welcoming group with a good community following, aiming to produce drama of the highest quality for their audience. For further information visit www.ecclesalltheatre.co.uk. P.S. Fans of the play will be delighted that this review is online and not in print as “It’s vulgar to print”.